Every year, students that were on the previous year's Seismo Lab Seminar Committee organize a day-long retreat to enable students and faculty of the Seismo Lab to interact with each other outside the academic environment. 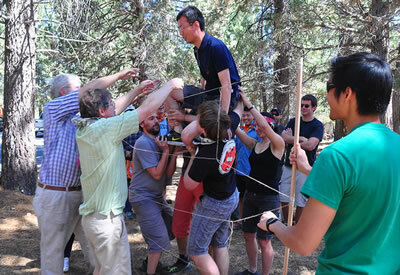 The idea of the retreat is to create teams made up of people who do not interact regularly, and devise fun games/sports/challenges that encourage team-building. The first retreat was held in the Spring of 2005 and was a great success. Retreats have been held annually ever since 2005 with generous funding from the Seismo Lab Director. Click on link above to see Retreat pages of the current as well as past years. The GPS Division soccer team plays in the GSC Intramural Soccer League. The team members wear navy blue or black shirts and have a policy that those who show up get to play. They are also responsible for providing referees at other teams' games. League games consist of two 30 minute halves and are held on Saturdays during the fall term and on Sundays during the winter term. Playoffs are at the beginning of the spring term. The GPS team plays for fun and does not often make it to the playoffs.